Can you believe that Mother’s Day is almost here again? We can’t either! Here at Abbey Cottage, we’re already making plans for what is a very special day. And we’re not alone either, with quite a few people getting in touch with us. So, what are you going to do to bring a smile to your mum’s face? We’ve got a couple of suggestions – and both of them are popular! It seems that all ages love Afternoon Tea! So, it’s a great way for all generations of your family to celebrate together. At Abbey Cottage, our Afternoon Tea Experience includes freshly made sandwiches with a choice of homemade fillings, homebaked scones with jam and cream, and of course cake – all nicely served at your table on a cake stand. You’ll also get to choose from our select list of tasty loose leaf teas. We’ll be serving Afternoon Teas all day on Mother’s Day and we do recommend you get in touch to book in advance. We want to be sure that everyone’s mum gets the treat she deserves! If you can’t be with your mum on Mothers’ Day and you want an alternative to flowers, then how about a gift that she can use another time? 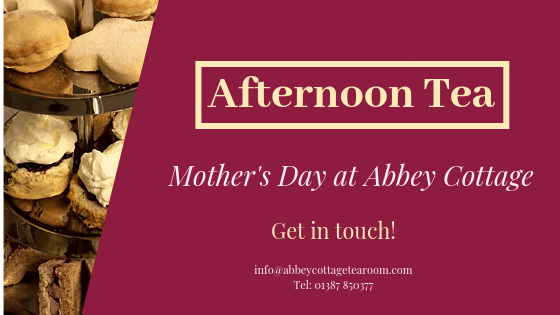 An Abbey Cottage Afternoon Tea Gift Voucher is a lovely solution. It has the added pleasure for Mum of being able to plan her treat… and look forward to it. It’s very easy to order a voucher from our website and we’ll post it to you (or your mum, so long as you give us all the details and your message). Whatever you decide to do on Sunday 31 March, have a wonderful time with mum, and let her know you love her.